Pallekele, Sri Lanka (AP) — India reinforced their position as the top-ranked team in test cricket by completing a rare 3-0 series whitewash in Sri Lanka with an innings victory inside three days in the third test on Monday. Spinner Ravichandran Ashwin took four wickets and seamer Mohammed Shami three as India bowled Sri Lanka out for 181 in the hosts’ second innings, sealing victory by an innings and 171 runs. India were dominant throughout the series, winning the first two matches by 304 runs and an innings and 53 runs. Sri Lanka had been whitewashed in a home series only once before, against Australia in 2004 — Ricky Ponting’s first series as Australian captain. Monday’s result was Sri Lanka’s fifth heaviest defeat ever in a test. 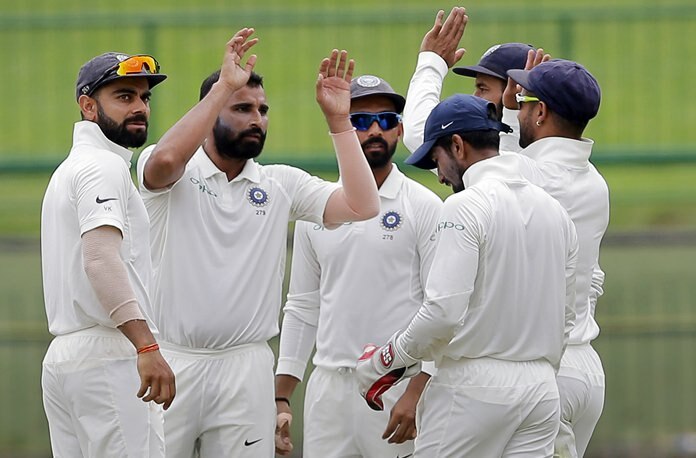 India made 487 batting first in the final test at Pallekele International Cricket Stadium and Sri Lanka collapsed in both innings to be out for 135 and then 181 after following on. India’s big first-innings total at Pallekele was built on centuries by opener Shikhar Dhawan (119) and Hardik Pandya (108). Resuming on 19-1 in their second innings, Sri Lanka lost three wickets quickly on Day 3 and were 39-4 before captain Chandimal (36) and Angelo Mathews (35) put up some temporary resistance. They took Sri Lanka to lunch on 82-4 but their 65-run partnership — easily the best of the innings — was ended with Chandimal’s dismissal by Kuldeep Yadav via a catch at short leg from Cheteshwar Pujara. From there, India took Sri Lanka’s last six wickets for 73 runs, with Niroshan Dickwella top-scoring for Sri Lanka with 41. India’s bowlers were on top throughout the test with no Sri Lankan batsman reaching 50 in either innings. After Chandimal went, off-spinner Ashwin struck twice by removing the experienced Mathews and Dilruwan Perera. Mathews was given out leg before wicket and the ex-Sri Lankan captain unsuccessfully reviewed the decision. A Perera slog-sweep went straight into the hands of Pandya fielding at deep mid-wicket. Tea was delayed as India opted for the extra half-hour with Sri Lanka down to nine wickets as the end of the session approached. Ashwin wrapped it up, bowling last man Lahiru Kumara to finish with 4-68.